You may see “failure to download files”, “cannot download”, or errors like “0x800F0954” when running DISM to install packages. 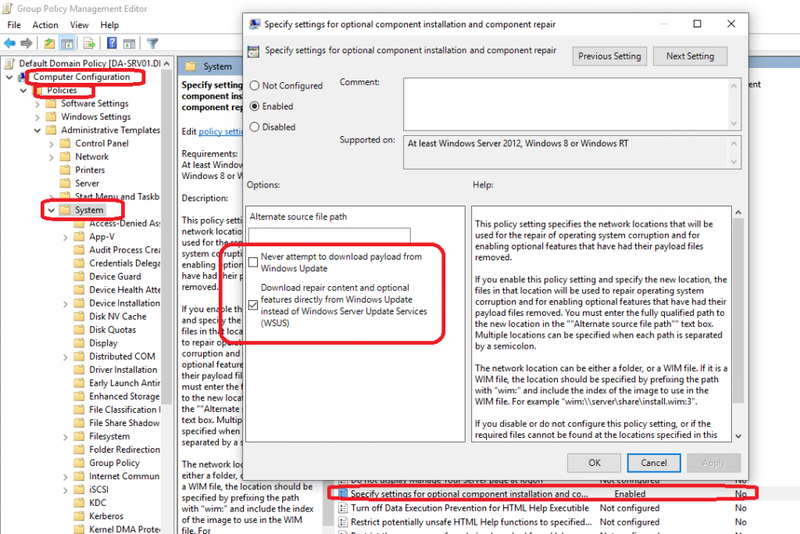 To resolve this, you need to modify your domain’s group policy settings to allow your workstations to query Windows Update servers for additional content. The workstations will still use your WSUS server for approvals, downloads, and updates, however in the event content is not found, it will query Windows Update. Navigate to “Computer Configuration”, “Policies”, “Administrative Templates”, and then “System”. Make sure “Download repair content and optional features directly from Windows Update instead of Windows Server Update Services (WSUS)” IS checked. Wait for your GPO to update, or run “gpupdate /force” on the workstations. You should now be able to download/install RSAT, .NET, Speech language packs, and more! Just a few words of warning when upgrading your VMware vSphere Windows 10 virtual machines to Windows 10 Version 1809 (October Update). When upgrading, after the first restart, you may notice multiple BSOD (Blue Screen of Death) with the error “Driver PNP Watchdog”. This will fail the upgrade. Update – November 14 2018: This issue is still occurring on upgrades using the re-released November version of the October update. Update and Fix – November 26th 2018: A very big thank you goes out to my reader Werner, who advised that the issue only occurs if the VM is in a snapshotted state. After his comment on this post, I decided to try upgraded without the VM in a snapshot state and it worked! Thanks Werner! When the upgrade fails, the system will re-attempt until utlimately failing and reverting to the previous version of Windows 10. In my case, I had a successful upgrade on numerous physical workstations, and a snapshot, so I decided to uninstall both the VMware tools agent, and VMware Horizon View agent. This had no affect and the VM still wouldn’t perform an upgrade. I’m not sure if it’s the fact that it’s a VM, the VMware tools install, or the VMware Horizon View agent install, however I highly recommend waiting to upgrade until all the bugs get sorted out. After you upgrade Microsoft Windows 10 to version 1809 (October Update) or later, you may notice that your RSAT (Remote Server Administration Tools) have uninstalled and that you cannot download or install RSAT on the new version of Windows 10. This is because Microsoft has provided the RSAT tools as part of “Features on Demand” on Windows 10 itself. This will apply to all future Windows 10 releases. Some of you may not be familiar with using the “Features on Demand” or “DISM” tool on Windows, so I decided to write up this little post to assist you in installing RSAT on the latest version of Windows 10. I’ve noticed an issue with Microsoft Windows Server 2016, where a default install, when joined to an Active Directory Domain, will not get it’s time from the domain itself, but rather from “time.windows.com”. I first noticed this a couple months ago when I had some time issues with one of my Server 2016 member servers. I ran “net time” which reported time from the domain controller, so I simply restarted the VM and it resolved the issue (or so I thought). I did not know there was a larger underlying issue. While performing maintenance today, I noticed that all Windows Server 2016 VMs were getting their time from “time.windows.com”. When running “w32tm /monitor”, the hosts actually reported the PDC time sources, yet it still used the internet ntp server. I checked all my Windows Server 2012 R2 member servers and they didn’t have the issue. All workstations running Windows 10 didn’t have the issue either. When this issue occurs, you’ll notice in the event log that the Windows Time Service actually finds your domain controllers as time sources, but then overrides it with the internet server time.windows.com for some reason. The only reference you’ll find pertaining to “time.windows.com”, will be when you run the “w32tm /query /configuration” command. 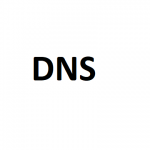 We need to change the time source from that host to the domain “NT5DS” time source. We’ll do so by resetting the configuration to default settings on the member server. PLEASE NOTE: Only run this on member servers that are experiencing this issue. Do not run this on your domain controller. After doing this, when running “w32tm /query /configuration” you’ll notice the time source will now reflect “NT5DS”, and the servers should now being using your domain hierarchy time sources (domain controllers). If you’re experiencing DNS issues (or internet issues) today on September 7 2018, you’re not alone. As of this morning, I’ve been noticing increased traffic coming in to my blog from people searching for DNS issues. 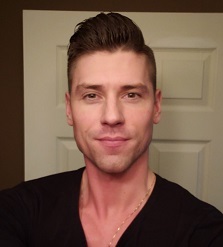 I decided to do a little investigation and noticed numerous people reporting DNS issues in Canada and the United States. While this is being reported by users across North America, I’ve been noticing a trend reporting issues that may be using Canadian hosted DNS Servers. I will be updating this post below as I find out more information. If you know anything or can contribute any information, please leave a comment below. Microsoft is ending extended support for Windows 7 on January 14th 2020. With Windows 7 reaching it’s end of life, I highly recommend that you start planning your upgrade from Windows 7 to Windows 10. When support ends, no more security patches or Windows updates will be available for the product. Expect numerous zero-day exploits to be released shortly after the product reaches EoL. So, what happens in a worst-case scenario where your backup system fails, you don’t have any VM snapshots, and the last thing standing in the way of complete data loss is your SAN storage systems LUN snapshots? Well, first you fire whoever purchased and implemented the backup system, then secondly you need to start restoring the VM (or VMs) from your SAN LUN snapshots. While I’ve never had to do this in the past (all the disaster recovery solutions I’ve designed and sold have been tested and function), I’ve always been curious what the process is and would be like. Today I decided to try it out and develop a procedure for restoring a VM from SAN Storage LUN snapshot. For this test I pretended a VM was corrupt on my VMware vSphere cluster and then restored it to a previous state from a LUN snapshot on my HPe MSA 2040 (identical for the HPe MSA 2050, and MSA 2052) Dual Controller SAN. To accomplish the restore, we’ll need to create a host mapping on the SAN for the LUN snapshot to a new LUN number available to the hosts. We then need to add and mount the VMFS volume (residing on the snapshot) to the host(s) while assigning it a new signature and then vMotion the VM from the snapshot’s VMFS to original datastore. When mounting a VMFS volume from a SAN snapshot, you MUST RE-SIGNATURE THE SNAPSHOT VMFS volume. Not doing so can cause problems. The snapshot cannot be mapped as read only, VMFS volumes must be marked as writable in order to be mounted on ESXi hosts. You must follow the proper procedure to gracefully dismount and detach the VMFS volume and storage device before removing the snapshot’s host mapping on the SAN. 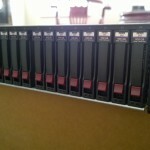 We use Storage vMotion to perform a high-speed move and recovery of the VM. If you’re not licensed for Storage vMotion, you can use the datastore file browser and copy/move from the snapshot VMFS volume to live production VMFS volume, however this may be slower. During this entire process you do not touch, modify, or change any settings on your existing active production LUNs (or LUN numbers). Restoring a VM from a SAN LUN snapshot will restore a crash consistent copy of the VM. The VM when recovered will believe a system crash occurred and power was lost. This is NOT a graceful application consistent backup and restore. Please read your SAN documentation for the procedure to access SAN snapshots, and create host mappings. With the MSA 2040 I can do this live during production, however your SAN may be different and your hosts may need to be powered off and disconnected while SAN configuration changes are made. Pro tip: You can also power on and initialize the VM from the snapshot before initiating the storage vMotion. This will allow you to get production services back online while you’re moving the VM from the snapshot to production VMFS volumes. I’m not responsible if you damage, corrupt, or cause any damage or issues to your environment if you follow these procedures. We are assuming that you have already either deleted the damaged VM, or removed it from your inventory and renamed the VMs folder on the live VMFS datastore to change the name (example, renaming the folder from “SRV01” to “SRV01.bad”. If you renamed the damaged VM, make sure you have enough space for the new restored VM as well. Identify the VM you want to recover, write it down. Identify the datastore that the VM resides on, write it down. Identify the SAN and identify the LUN number that the VMFS datastore resides on, write it down. Identify the LUN Snapshot unique name/id/number and write it down, confirm the timestamp to make sure it will contain a valid recovery point. Log on to the SAN and create a host mapping to present the snapshot (you recorded above) to the hosts using a new and unused LUN number. Log on to your ESXi host and navigate to configuration, then storage adapters. Select the iSCSI initator and click the “Rescan Storage Adapters” button to rescan all iSCSI LUNs. Ensure both check boxes are checked and hit “Ok”, wait for the scan to complete (as shown in the “Recent Tasks” window. Now navigate to the “Datastores” tab under configuration, and click on the “Create a new Datastore” button as shown below. Continue with “VMFS” selected and select continue. In the next window, you’ll see your existing datastores, as well as your new datastore (from the snapshot). You can leave the “Datastore name” as is since this value will be ignored. In this window you’re going to select the new VMFS datastore from the snapshot. Make sure you confirm this by looking at the LUN number, as well as the value under “SnapshotVolume”. It is critical that you select the snapshot in this window (it should be the new LUN number you added above). On the next window “Mount Option”, you need to change the radio button to and select “Assign a new signature”. This is critical! This will assign a new signature to differentiate it from your existing real production datastore so that the ESXi hosts don’t confuse it. Continue with the wizard and complete the mount process. 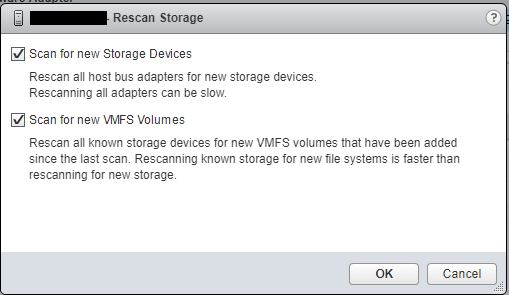 At this point ESXi will resignture the VMFS volume and rename it to “snap-OriginalVolumeNameHere”. You can now browse the VMFS datastore residing on the LUN snapshot and do anything you’d normally be able to do with a normal datastore. Now we’ll go to the vCenter/ESXi host storage area in the web client, and using the “Files” tab, we’ll browse the snapshots VMFS datastore that we just mounted. Locate the folder for the VM(s) you want to recover, open the folder, right click on the vmx file for the VM and select “Register VM”. Repeat this for any of the VMs you want to recover from the snapshot. Complete the wizard for each VM you register and add it to a host. Go back to you “Hosts and VMs” view, you’ll now see the VMs are added. Select and right click on the VM you want to move from the snapshot datastore to your production live datastore, and select “Migrate”. In the vMotion migrate wizard, select “Change Storage only”. Continue to the wizard, and storage vMotion the VM from the snapshot VMFS to your production VMFS volume. Wait for the vMotion to complete. After the storage vMotion is complete, boot the VM and confirm everything is functioning. On each of your ESXi hosts that have access to the SAN, go to the “Datastores” section under the ESXi hosts configuration, right click on the snapshot VMFS datastore, and select “Unmount”. You’ll need to repeat this on each ESXi host that may have automounted the snapshot’s VMFS volume. On each of your ESXi hosts that have access to the SAN, go to the “Storage Devices” section under the ESXi hosts configuration and identify (by LUN number) the “disk” that is the snapshot LUN. Select and highlight the snapshot LUN disk, select “All Actions” and select “Detach”. Repeat this on each host. Double check and confirm that the snapshot VMFS datastore (and disk object) have been unmounted and detached from each ESXi host. You can now log in to your SAN and remove the host mapping for the snapshot-to-LUN. We will not longer present the snapshot LUN to any of the hosts. Back to the ESXi hosts, navigate to “Storage Adapters”, select the “iSCSI Initiator Adapter”, and click the “Rescan Storage Adapters”. Repeat this for each ESXi host. One of the coolest things I love about running VMware Horizon View and VDI is that you can repurpose old computers, laptops, or even netbooks in to perfect VDI clients running Linux! This is extremely easy to do and gives life to old hardware you may have lying around (and we all know there’s nothing wrong with that). I generally use Fedora and the VMware Horizon View Linux client to accomplish this. See below to see how I do it! Download the Fedora Workstation install or netboot ISO from here. Burn it to a DVD/CD if you have DVD/CD drive, or you can write it to a USB stick using this method here. 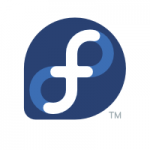 Install Fedora on to your laptop/notebook/netbook using the workstation install. To run the client, you can find it in the GUI applications list as “VMware Horizon Client”, or you can launch it by running “vmware-view”. -Some of the prerequisites above in the guide may not be required, however I have installed them anyways for compatibility. After doing a fresh install or upgrade of Fedora Core Linux (FC28 in my case), you may notice that when the system boots it gets stuck on a black screen with a white cursor. The cursor will not move and there will be no drive activity. This issue occurs with GNOME on my old HP Mini 210 Netbook every time I do a fresh install of Fedora on it (or upgrade it). Follow the process below to temporarily boot and then permanently fix it. Power on the computer, and carefully wait for the GRUB bootloader to appear (the boot selection screen). When the GRUB bootloader appears, press the “e” key to edit the highlighted (default) boot entry. Scroll down until you get to the line starting with “linux16”, then use your right arrow key and scroll right until you get to the end of the kernel options (while scrolling right, you may scroll multiple lines down which is fine and expected). The line should finally end with “rhgb” and “quiet”. Press “CTRL+x” to boot the system. The system should now boot. FYI: “rhgb” is the kernel switch/option for redhat graphical boot, and “quiet” makes the system messages more quiet (who would have guessed). Once the system has booted, log in. Open a terminal window (Applications -> Terminal, or press the “Start” button and type terminal). Restart your system, it should now boot! Please Note: Always make sure you have a full system backup before modifying any system files!